Everyone knows garlic lingers on your breath, but it’s so delicious we love it anyway! It’s also very easy to grow, and November is a great time to plant it here in the Triangle. Research has mixed results on its health benefits, such as preventing heart disease, cancer and the common cold, but it has been safely used medicinally and as a flavor enhancer for over 5,000 years. Garlic is in the Amaryllidaceae family like its relative, the onion. No surprise there. There are two main subspecies of garlic – softneck (Allium sativum ssp. sativum) and hardneck (A. sativum spp. ophioscorodon). 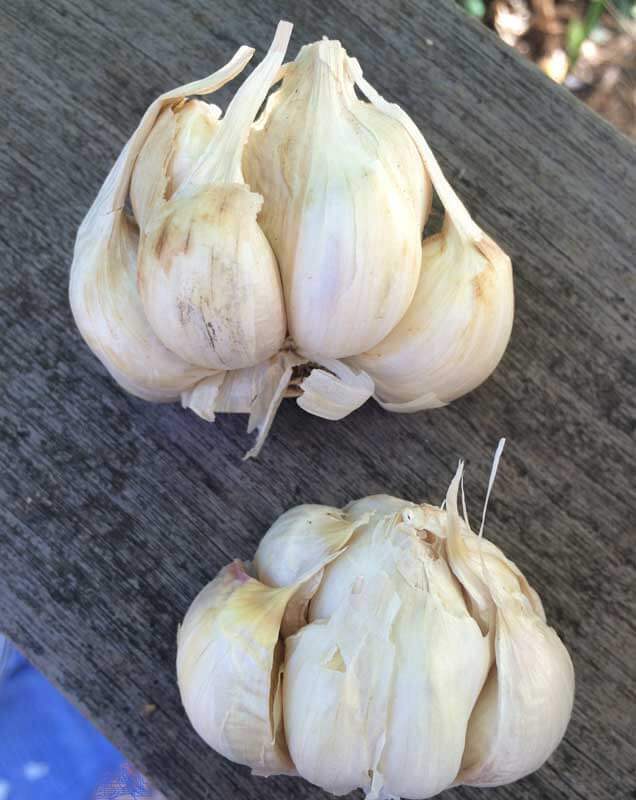 You also often hear of elephant garlic (A. ampeloprasum) but it’s not a true garlic (it’s a type of leek) and honestly I don’t think it carries enough flavor to bother planting it. When you start exploring the different tastes and pungencies of garlic that are available to grow, you will be hooked on these aromatic wonders and leave the elephant garlic to the kids. The softnecks are the ones we most often see in the grocery store as they grow widely and store well. Because they don’t usually produce a flower stalk, their stem is soft enough to be braided as they are drying, hence the name. 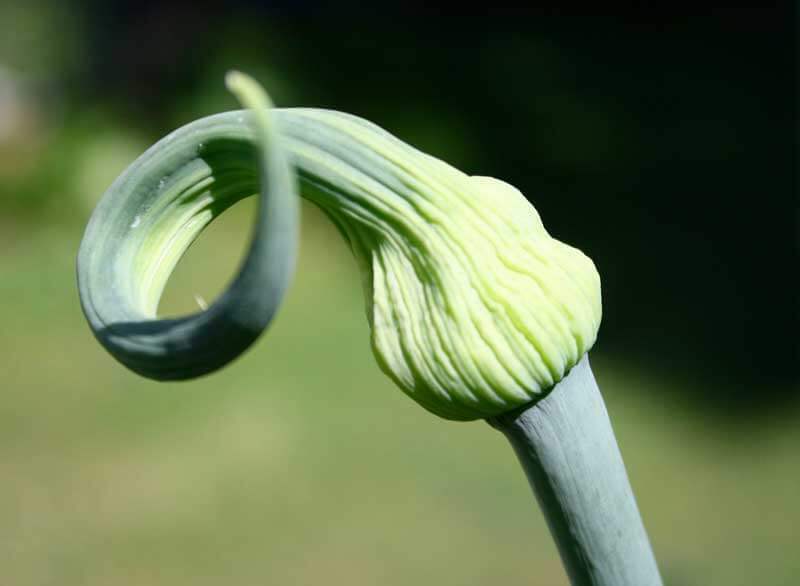 Hardneck varieties produce an elongated flower stalk in late spring (edible “scapes”) that makes their stem firm and less flexible. Softneck varieties also tend to have more cloves that grow tightly together as compared to the larger and fewer cloves on the hardnecks. In the flavor contest, hardnecks may be spicier and more flavorful. But since hardnecks thrive in colder climates, I recommend growing both types to ensure a vigorous and varied crop of garlic. Like most fall-planted crops, the goal is to get garlic in the ground and growing before winter freezes slow things down. If planted too early, however, they put on excessive growth that may not be winter hardy. October through November is a good time for planting here in the Triangle. 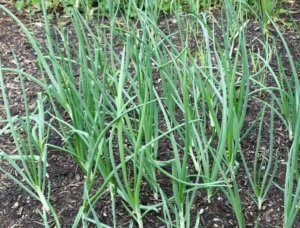 Garlic prefers loamy, well-drained soil in full sun with a pH of 6.2-6.8. In our clay soils, this means mixing in some compost and making a raised bed to deal with our frequent downpours. 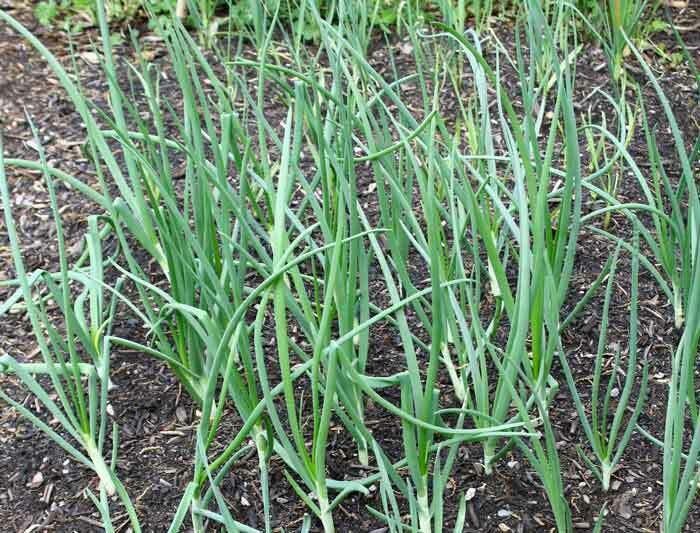 Despite their small size, garlic is a heavy feeder so plan to apply fertilizer at planting and again in March and May. 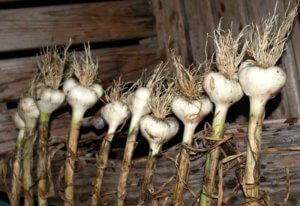 Plant the individual cloves you have peeled from your head of garlic with the pointed side up, about 1 to 2 inches in the soil and 4 to 6 inches apart, with 6 to 12 inches between rows. Light mulching with straw, pine straw, or leaf compost will keep prevent winter injury and keep weeds at bay. In the spring, cut off the scapes of the hardnecks to enjoy eating and to boost the size of the garlic. When the leaves begin to discolor and dry down in early summer, the garlic should be ready to harvest. Dig them carefully, removing the soil gently and avoid bruising the heads. Lay them in a shady, dry location or hang them until they are thoroughly dry, which may take a few weeks. Then remove the stems and remaining soil and roots and they are ready to store and eat throughout the coming months. Softnecks: Most dependable in the Triangle region. Hardnecks: Best in cold winters, not as dependable here. You can find locally grown garlic at farmer’s markets for a quick source of plant material.